Heals fast. 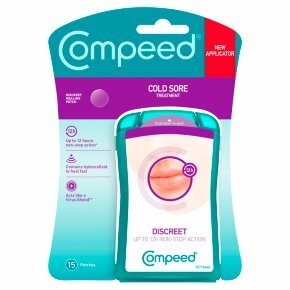 Compeed® Cold Sore treatment is the first invisible healing patch for cold sores. Each invisible patch creates an optimal healing environment and stays in place for up to 12 hours. Up to 12 hours non-stop action from Day 1 - to heal fast* *In a clinical study involving 174 subjects 25% of the subjects had a wear time of 12 hours or more. Acts like a virus shield** **The patch acts like a virus shield to reduce risk of contamination from the cold sore. For best results start using a patch day and night throughout the outbreak until the lesion is fully healed. Instructions Easy to apply. Do not apply cream before use. With mirror inside. Peel off blue foil on mirror. Make-up or lipstick can be applied over the patch. Leave patch on until it detaches itself from the skin.